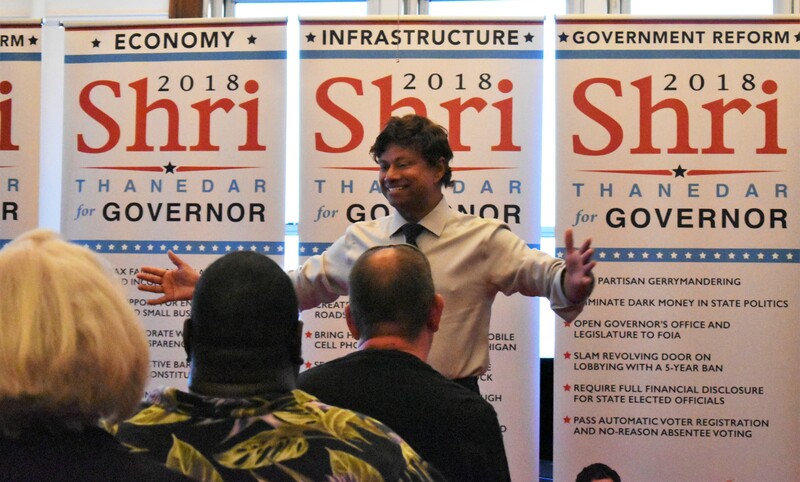 FLINT, MI – Democratic gubernatorial candidate Shri Thanedar proposed on Thursday the creation of a position in the Michigan Governor’s Cabinet dedicated solely to addressing the needs of Flint as the city recovers from its water crisis. Thanedar’s proposal came during a town hall hosted in the Flint Masonic Temple as part of his campaign’s “no B.S. tour,” a play on Republican gubernatorial candidate Bill Schuette’s initials. After the conclusion of the event, campaign volunteers helped to distribute seven palettes of water donated by Thanedar. “I will make sure that we continue [distributing] bottled water,” Thanedar noted in his opening remarks. Recent polling from the Detroit Regional Chamber places Thanedar as the front-runner in the Democratic primary, leading former Senate Minority Leader Gretchen Whitmer 29.6 percent to 26.3 percent. Dr. Abdul El-Sayed trails both with the backing of 6.6 percent of surveyed Democrats. Whitmer has picked up the endorsements of Congressman Dan Kildee (MI-05), former U.S. Senator Carl Levin (D-MI), former Michigan Governor Jim Blanchard, Detroit Mayor Mike Duggan, EMILY’s List, the Michigan Education Association, United Automobile Workers, and the Michigan AFL-CIO. El-Sayed, meanwhile, has been endorsed by Congressman Ro Khanna (CA-17), Our Revolution President Nina Turner, activist Shaun King, activist Mari “Little Miss Flint” Copeny, Justice Democrats, Democracy for America, and the Michigan Nurses Association. One of the three Democratic candidates will face either Attorney General Bill Schuette, Lieutenant Governor Brian Calley, Michigan Senator Patrick Colbeck, or Dr. Jim Hines in the general election. Schuette leads the Republican primary with 36.3 percent support, compared to Calley’s 23 percent, according to the Detroit Regional Chamber. Colbeck and Hines polled at 4.3 percent and 1.3 percent, respectively. President Donald Trump, Vice President Mike Pence, former Michigan Governor John Engler, Congressman John Moolenaar (MI-04), the Michigan Chamber of Commerce, and the Michigan Restaurant Association have endorsed Schuette for governor. Calley’s campaign has received the endorsements of incumbent Michigan Governor Rick Snyder and businessman Dan Devos, while Colbeck has the support of U.S. Senator Ted Cruz (R-TX) and media personality Sean Hannity. More than 30 percent of survey participants from both the Democratic and Republican parties remain undecided about who to support in the primary. Michigan will hold its primary election on Aug. 7, ahead of the Nov. 6 general election. Polling conducted by EPIC-MRA shows Thanedar defeating Schuette 44 percent to 38 percent and Whitmer defeating Schuette 43 percent to 38 percent in two hypothetical general election match-ups.